Trash up to 5 programs from your grip. Gain 2credit for each program trashed. Freelance Coding Contract suffers from one fact : it’s in the faction that has Self-modifying Code and Test Run. As this, when deck building, players put generally 1x of each program, rarely more except for SMC. 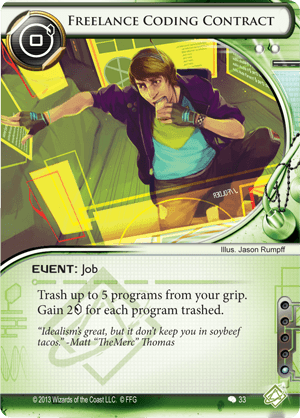 So when playing such a deck, you will unlikely have a load of program you want to feed this card. Either it’s early game and you’d rather install them, or it’s late game and they’re installed. Of course, there’s Clone Chip, but you’re probably more willing to use it for recursing Parasite, Sharpshooter or a lost program than for making some shenanigans with this card for money and further usage. Also, when doing that, you trash a certain number of card, and emptying their hand is not something the Runners like to do. They have then to click for drawing, so it’s money against tempo. Not great.